The Chennai Superkings(CSK) under the captaincy of Dhoni has now won 4 out of 4 to remain the only team to be unbeaten in IPL. Today the CSK defeated the sorry Bangalore Royal challengers by 13 runs to hand Vijay Mallya’s team their 3rd defeat in 4 games. 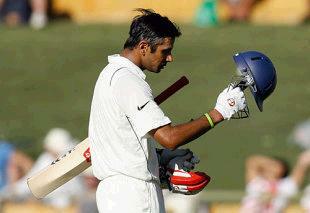 The team captain Rahul Dravid made his second duck in consecutive games to make things worse for his team. The main problem for the BRC is that they dont have any player in the team apart from Ross Taylor who looks like a Twenty20 specialist. Even though the Royal challengers beat Mumbai Indians (The other struggling team in the tournament) they still look out of sorts and the captain seems to be running out of ideas. The absence of a renowned big hitter in the team is costing the BRC’s a lot. The role played by Dhoni for the chennai team today is what that is lacking for the Royal Challengers. Martin Crowe and Rahul Dravid have to sit together and come up with a better strategy to make optimum use of the available resources. The Chennai Superkings though have done exceedingly well in this tournament and at the end of the first week they are at the top of the table. Great performances by the inexperianced bowling line up and consistancy at the top of the order has helped them to succeed. Dhoni’s captaincy has again been very precise and his cool head under pressure situations has helped the team from Chennai. Dhoni has got great response from his inexperianced bowling line up and the inclusion of Albie Morkel and Makaya Ntini will sure bolster the same. Elsewhere the Mumbai Indians crashed to their 4 consecutive defeat of the tournament and remain the only team to have not won a game yet. Their team looks in total shambles in the absence of their icon player Sachin Tendulkar and Harbajan recently due to his row with Sreesanth. Rajasthan Royals continue to impress with their 3rd consecutive win and are in second spot behind the CSKs. Punjab Kings X1 also overcame a dissapointing start to the tournament to win two games in a row to put them back in contention. Adam Gilchrist’s fastest IPL century gave the strong Deccan Chargers their first victroy of the tournament against the hapless Mumbai attack. The first week of cricket was really interesting and entertaining. When IPL began I was little skeptical regarding the same due to the involvement of the bollywood and the kollywood stars but after the first few games the focus has shifted to cricket. Cricket has been really fantastic only the Harbajan and Sreesant row has taken some sheen of a good week’s cricket. Harbajan has plead guilty and has been handed 10 games ban from IPL whereas Sreesanth has been let off with a warning. I guess Sreesanth needs to be handed a more serious punishment than just a warning. His behaviour on the field is still questionable. The fact that Sreesant cried and made a scene in front of millions of viewers accross the world should not excuse him from the ridiculous behaviour in that match when he was bowling. Behaviour like that in the name of aggression should not be tolerated in any sport.